Paw Print Genetics - Are you helping your dog stay on Santa's good dog list? 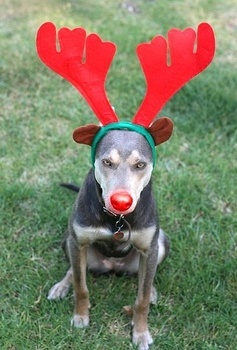 Are you helping your dog stay on Santa's good dog list? HO, HO, OH NO! If you’ve recently been to a local department store, you were likely made well aware that the holiday season is upon us. It may be that my recollections of youth have faded some over the years, but does anyone remember holiday decorations in stores before Halloween when they were kids? I sure don’t. Another thing I can’t remember from my youth is anyone warning us about potential dangers to our dogs during the holiday season. The canine exodus from the backyard to the bedroom over the past 30 or so years has been remarkable. Development of once-monthly parasite control and changing social, cultural and familial norms have been important contributing factors to the modern, intimate relationship with our former hairy lawn ornaments. With this change, comes a different set of responsibilities in keeping our dogs safe and healthy. Once threatened by wild animals, parasites and seasonal extremes, our dogs now face a multitude of new threats to their health associated with the modern American lifestyle. Halloween to New Year’s Day is an interesting time to be an emergency veterinarian. Whether it is food, decorations, or other hazards, many dogs end up learning the hard way that despite all of the benefits that living with people brings, there can be some serious consequences to their interrelationship with humans. One such “benefit” that dogs obtained in their move into the house is abundant access to food. In most American households, the holidays and food are deeply interwoven. From the turkey dinner of Thanksgiving to that finely crafted ham on Christmas, if we could ask them, I’m sure that dogs would say that they love the holidays almost as much as we do. Even some of the best mannered pooches cannot refrain from grabbing a belly full of unclaimed calories from counter tops, garbage and the dinner table during this time of year. Given the inherent nature of dogs as opportunistic eaters, the holidays are a toxic land mine for dogs. Food is often readily available at holiday gatherings and sharing time with friends and family means that we often pay much less attention to what our dogs are doing. It only takes a few seconds for a dog to eat something that everyone may regret. A common food that brings dogs to the vet hospital is chocolate. Most people are aware that this delectable treat can be toxic to our dogs. However, not all chocolates are created equally in regards to toxicity. The major toxic component in chocolate is a chemical similar to caffeine called theobromine. Theobromine is a naturally occurring stimulant produced by the cacao (cocoa) plant as well as others. Production of chocolate from the cacao plant leads to this chemical being present in various concentrations depending on the type of chocolate produced. What many people don’t know is that luckily, most of the chocolate that we eat is of the “milk chocolate” variety that tends to have much lower concentrations of theobromine than other forms. A potentially lethal dose of theobromine in dogs is about 45-114 milligrams of drug per pound of body weight. Milk chocolate tends to have about 44-60 milligrams of theobromine per ounce (Peterson and Talcott 2006). Therefore, a 60 lbs dog would need to eat at least 60 oz (3.8 lbs) of milk chocolate to be in the lethal dose range; quite a task, but obtainable by some dogs! In contrast, cocoa powder, often used for baking, has a concentration of approximately 400-737 milligrams of theobromine per ounce. The same 60 lbs dog would only need to eat about 4 oz of certain cocoa powders to obtain a potentially lethal dose. Actual cocoa beans or cocoa mulch can have even higher concentrations of theobromine. Please note that dogs that eat less than these amounts of chocolate or cocoa powder can still get very sick from their dietary indiscretion and need veterinary care, but are less likely to die. Another common staple of the holidays is bread. Many people make their own bread during the holiday season and would not think about the potential toxic implications to their dogs. However, bread dough can be a serious food hazard for dogs. The cause of bread dough toxicity is less obvious. Dough expands in the stomach of dogs after consumption and can lead to a severely distended stomach. On occasion, bloat (also called gastric-dilitation volvulus), a life threatening condition where the stomach rotates and cuts off blood supply to abdominal organs, can occur due to the stomach distention. In addition, as yeast in the unbaked dough ferments, carbon dioxide and ethanol are produced. The ethanol is rapidly absorbed and can cause severe intoxication leading to coma and even death similar to alcohol poisoning in people who consume too much alcohol. Other foods that can be particular hazards for dogs around the holiday season are grapes and raisins (kidney failure), macadamia nuts (GI problems, joint pain, inability to walk), turkey bones (stomach or intestinal perforation), and the artificial sweetner, xylitol (severe hypoglycemia, liver failure, GI problems, death) used to sweeten gum, candy, mints and other sugar-free products. A common mistake of dog owners is sharing the holiday food bounty with their dog. Many owners will throw food scraps in Rex’s food dish so they can enjoy the experience of the holidays too. Unfortunately, some dogs can develop a life-threatening and extremely painful condition called pancreatitis in which the digestive enzymes that the pancreas secretes in order to help us digest our food become activated too early causing the enzymes to begin digesting the pancreas and surrounding tissues themselves! Although the exact mechanisms by which pancreatitis begins are not well understood, the disease is often preceded by consumption of a new, particularly fatty food source or an excursion into the garbage for food. The few treatments available are mostly symptomatic and supportive therapies such as pain relief, IV fluid therapy and time. In severe cases, dogs can develop other life threatening complications associated with the severe inflammation this condition causes in the abdominal cavity. Unfortunately, dogs don’t just eat food; dogs will eat just about anything. I have seen rocks, hair ties, chewed up soda cans, TV remote controls, rubber balls, a corn cob, and many other objects removed from the stomach and intestinal tract of dogs. Included in this list are many objects associated with the holidays. Bows, wrapping paper, tinsel, and other Christmas items are potential hazards for the indiscriminate canine. I even watched a colleague of mine remove broken glass and metal from Christmas lights found in a dog’s stomach on a set of unmerry Christmas Eve x-rays. Many Christmas lights contain lead and can sometimes cause heavy metal toxicity in dogs. Luckily for this particular critter, he did not have issues related to lead toxicity and the lights were unplugged at the time he got a taste for glass and metal, as electrocution from Christmas lights is not unheard of in dogs either. Fortunately, most dogs stop eating random objects as they age. However, puppies and young adult dogs commonly will pick up any novel item from the floor and see how it feels in their mouth, sometimes actually swallowing pieces as they chew it up. Therefore, it is particularly important to pick up objects if you have a young dog in the house. This is especially true if you leave your dog alone for any length of time. Other hazards that dogs consume around the holidays are the liquid from potpourri pots (severe chemical burns and potential GI toxicity) or toxic chemicals placed in Christmas tree water to keep the tree alive longer. In addition, some common plants are often eaten by dogs around the holiday season. Poinsettias (GI problems and skin irritation), mistletoe (GI problems, neurologic disease, death), and holly (GI problems) are just three of many toxic plants that can temper your dog’s holiday cheer. As a general rule, it’s a good idea to keep all plants out of your dog’s reach. If your dog ever consumes something that may be toxic, it’s a good idea to get assistance right away. However, toxicity is related to the dose of the poisonous ingredient. A couple of great resources to help you determine whether your dog may need assistance or not are the Pet Poison Helpline (www.petpoisonhelpline.com) and the ASPCA Animal Poison Control line (www.aspca.org/pet-care/animal-poison-control). Make sure to have all packaging available (if any) when you call. For a fee, the staff at these hotlines will ask questions to determine the quantity of toxin consumed and then give recommendations for treatment. Veterinary treatment options normally include induction of vomiting, activated charcoal treatment (to bind toxins and prevent them from being absorbed in the GI tract), and GI protectant medications. This holiday season, keep your dog on Santa’s good dog list! Eliminate potentially hazardous temptations from your dog’s world by placing them beyond the reach of their ever-hungry and curious mouths. It will make for a more joyous holiday season and keep money in your pocket for loved ones’ gifts instead of helping your local veterinarian buy gifts for their friends and family! Peterson ME, Talcott PA. 2006. Small Animal Toxicology. Elsevier Inc. St. Louis, Missouri, pgs.845-51.